I came back from Japan with a five year old and a three year old with heads full of Sailor Moon, Anpanman and Miyazaki Hayao, so inevitably when we signed up for cable back in the UK we turned to Cartoon Network. When I was a kid TV cartoons were pretty dire. I grew up a fan of Filmation (responsible for, among other things, the animated Star Trek) and have a lot of affection for their peculiar style of ‘minimal’ animation, wonderfully sent up here in Cheapo Cartoon Man. By comparison most of the stuff my kids were watching was brilliant – imaginative, stylish and very funny, especially series like Dexter’s Laboratory and Courage the Cowardly Dog. Among all of these my favourite by far was Samurai Jack. Living in Japan for ten years made me a bit jaded and snooty about the portrayal of that country’s traditions and cultures in the West. 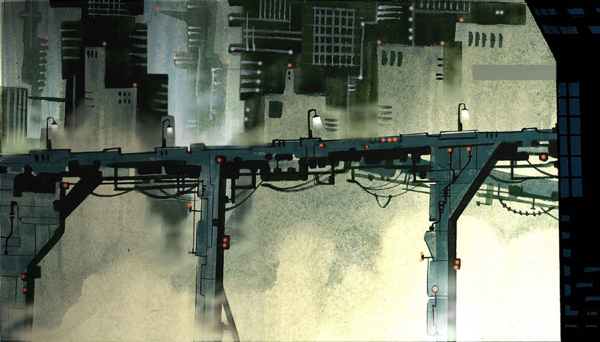 Despite Cyberpunk dreams there are no corporate samurai or ancient traditions of bushido lurking under the surface of the Chiba/Tokyo sprawl. The average Japanese man or woman regards practitioners of martial arts pretty much in the way we look at Morris Dancers, and most are more concerned with struggling through their stressful office jobs, getting their kids to a decent school and paying off the mortgage. The biggest shock was the attitude to the films of Akira Kurosawa, who I’d always thought of as the backbone of Japanese culture. ‘He makes boring, pretty films for foreigners’ summed up the general attitude, a comment borne out by the fact that all of his later films were funded by people like George Lucas and Francis Ford Coppola. Long ago in a distant land, I, Aku, the shape-shifting Master of Darkness, unleashed an unspeakable evil! But a foolish Samurai warrior wielding a magic sword stepped forth to oppose me. Before the final blow was struck, I tore open a portal in time and flung him into the future, where my evil is law! Now the fool seeks to return to the past, and undo the future that is Aku! 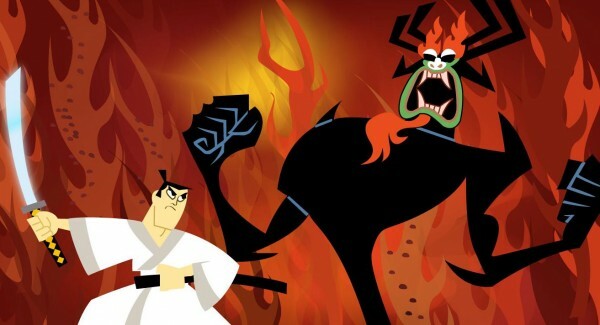 By dumping a medieval samurai in a cyberpunk future ruled by the evil demon Aku the producers, led by Genndy Tartakovsky, could go to town with their imaginations, setting the honourable though slightly dim hero against ancient gods, alien assassins, killer robots, bounty hunters, deranged Scotsmen and all manner of odd foes. Every other episode was a clear tribute to a genre film or TV series, whether it was 300, My Neighbour Totoro or The Matrix. Most of the stories had Jack (a name given to him by a gang of bizarre street punks on his first arrival in the future) hunting for the portal to take him back to his own time in the hope he could change history by slaying the demon Aku. Others saw him tackling specific foes or setting off on bizarre quests (including finding himself a new pair of Japanese clogs when the old ones are stolen). Not only were the 30 minute episodes a fascinatingly eclectic bunch of adventures, but the editing and visual style also stood out a mile from other cartoons. To begin with the designers took the decision to avoid outlining, relying instead on minimal and often abstract designs and colour to distinguish between shapes on the screen. This gave the cartoon a visual elegance you don’t usually see in animation, and some of the scenes, clearly influenced by Chinese and Japanese ink paintings, are actually quite beautiful. Samurai Jack also drew heavily on the styles of editing used in Japanese movies and Spaghetti Westerns. Unusually for cartoons the producers were not afraid to have long periods without speech, relying instead on images, close ups and subtle sound effects. Split screen, rapid cutting and sudden slow motion also allowed for the ratcheting up of tension during action shots. Most of Jack’s foes are robots, which got around the problem of gore during the often pretty violent battle sequences. As animation, and a loving tribute to science fiction, fantasy and Japanese popular culture Samurai Jack is one of the best cartoon series I’ve seen. Not every episode is spot on, and sometimes the extended fights. where Jack dismembers yet more robots, drag a little, but there are very few bum notes in the four seasons that were made. 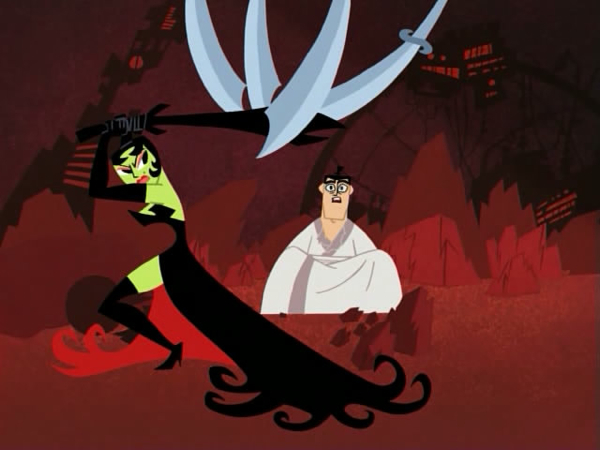 To my mind the best episodes are number 6 in Season 1 (don’t read the description on iTunes, it has a major spoiler), Episode 5 Series 3 in which Jack confronts the ancient Egyptian Gods and the two parter from the same Season (11 and 12) which tell of the birth of the evil Aku (voiced by the Japanese actor Makoto Iwamatsu who played the shaman alongside Arnie in Conan the Barbarian). All the episodes are available from Amazon or on iTunes.